Quizá no haya país en el mundo en que la palabra «guerrillero» no sea simbólica de una aspiración libertaria para el pueblo. Solamente en Cuba esta palabra tiene un significado repulsivo. Esta Revolución, libertadora, en todos sus extremos, sale también a dignificar esa palabra. Todos saben que fueron guerrilleros aquellos simpatizantes del régimen de esclavización española que tomaron las armas para defender en forma irregular la corona del rey de España; a partir de ese momento, el nombre queda como símbolo, en Cuba, de todo lo malo, lo retrógrado, lo podrido del país. Sin embargo, el guerrillero es, no eso, sino todo lo contrario; es el combatiente de la libertad por excelencia; es el elegido del pueblo, la vanguardia combatiente del mismo en su lucha por la liberación. Porque la guerra de guerrillas no es como se piensa, una guerra minúscula, una guerra de un grupo minoritario contra un ejército poderoso, no; la guerra de guerrillas es la guerra del pueblo entero contra la opresión dominante. El guerrillero es su vanguardia armada; el ejército lo constituyen todos los habitantes de una región o de un país. Esa es la razón de su fuerza, de su triunfo, a la larga o a la corta, sobre cualquier poder que trate de oprimirlo; es decir, la base y el substratum de la guerrilla está en el pueblo. Esta Reforma Agraria que hoy se está haciendo, que empezó tímida en la Sierra Maestra, que se trasladó al Segundo Frente Oriental y al macizo del Escambray, que fue olvidada algún tiempo en las gavetas ministeriales y resurgió pujante con la decisión definitiva de Fidel Castro es, conviene repetirlo una vez más, quien dará la definición histórica del «26 de julio». 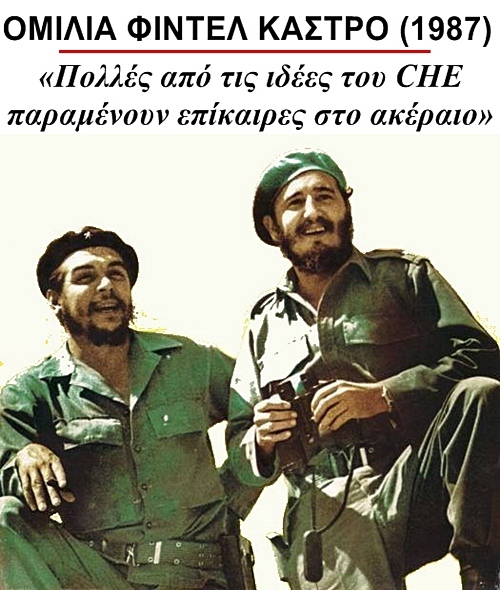 Δημοσιεύθηκε την Ιουλίου 21, 2012 από GuevaristasPosted in Ernesto Che GuevaraΜε ετικέτα ¿Qué es un "guerrillero"?,Ernesto Che Guevara,ESPANOL,Guerilla Warfare. Η Λαϊκή Δημοκρατία του Κονγκό ή αλλιώς Λαοκρατική Δημοκρατία του Κονγκό γνωστή στη γαλλική γλώσσα ως «République Démocratique du Congo» (πρώην Ζαΐρ) είναι μια χώρα της Κεντρικής Αφρικής με πληθυσμό περίπου 68.693.000 κατοίκους (εκτίμηση 2009) και έκταση 2.345.410 km². Η χώρα χαρακτηρίζεται και πήρε το όνομά της από τον μεγάλο ποταμό Κονγκό, ο οποίος με τους παραποτάμους του διασχίζει ολόκληρη τη χώρα. Καταλαμβάνει το μεγαλύτερο μέρος της λεκάνης του ποταμού Κόνγκο, ενώ προς τα ανατολικά του κλείνεται από το υδάτινο τείχος των λιμνών Ταγκανίκα, Κίβου, Εδουάρδου, Αλβέρτου κ.ά. Πρωτεύουσα του κράτους είναι η Κινσάσα. Ο Τσε κρατάει στην αγκαλιά του ένα μικρό αφρικανάκι, Κονγκό, 1965 (ή 1966). Απελευθερωτικού Στρατού. Ο Τσε, έχοντας το ονοματεπώνυμο Ραμόν Μπενίτεζ, έφτασε τον Απρίλιο του 1965 στη χώρα, έχοντας μαζί του δώδεκα κουβανούς πολεμιστές, και ανέλαβε να προετοιμάσει το έδαφος γιά μιά σειρά ανταρτοπολέμων στην καρδιά της Αφρικής. Σύμφωνα με τον τότε πρόεδρο της Αλγερίας, Αχμέντ Μπεν Μπέλα, ο Γκεβάρα έβλεπε την Αφρική ως τον «αδίναμο κρίκο του ιμπεριαλισμού» που είχε δυνατότητες να δημουργήσει επαναστατικά κινήματα. Ο τότε ισχυρός άνδρας του αραβικού κόσμου και πρόεδρος της Αιγύπτου, Γκαμάλ Αμπντέλ Νάσερ δεν είδε με καλό μάτι την κίνηση του Τσε (τον οποίο είχε γνωρίσει), θεωρώντας ότι η όλη προσπάθεια γιά δημιουργία επαναστατικού θύλακα στο Κονγκό θα οδηγούνταν σε αποτυχία. Τον Τσε Γκεβάρα και τη μικρή – αρχικά – ομάδα του ενίσχυσαν περίπου 100 αφροκουβανοί στρατιώτες που ήρθαν από την Κούβα γιά να ενισχύσουν τους κονγκολέζους αντάρτες. Ο Τσε συνεργάστηκε με το Κίνημα «Σίμπα», μιά μαρξιστικών ιδεών ομάδα που είχε δημιουργηθεί λίγα χρόνια πριν. Ταυτόχρονα, η κουβανική αποστολή συνεργάστηκε με τον αφρικανό αντάρτη Λοράν Ντεζιρέ Καμπιλά, με σκοπό την ένοπλη αντιμετώπιση των δυνάμεων της δικτατορίας που είχε δολοφονήσει το νόμιμα εκλεγμένο πρόεδρο Πατρίς Λουμούμπα το 1961. The armed victory of the Cuban people over the Batista dictatorship was not only the triumph of heroism as reported by the newspapers of the world; it also forced a change in the old dogmas concerning the conduct of the popular masses of Latin America. It showed plainly the capacity of the people to free themselves by means of guerrilla warfare from a government that oppresses them. 1. Popular forces can win a war against the army. 2. It is not necessary to wait until all conditions for making revolution exist; the insurrection can create them. 3. In underdeveloped America the countryside is the basic area for armed fighting. Of these three propositions the first two contradict the defeatist attitude of revolutionaries or pseudo-revolutionaries who remain inactive and take refuge in the pretext that against a professional army nothing can be done, who sit down to wait until in some mechanical way all necessary objective and subjective conditions are given without working to accelerate them. As these problems were formerly a subject of discussion in Cuba, until facts settled the question, they are probably still much discussed in America. Naturally, it is not to be thought that all conditions for revolution are going to be created through the impulse given to them by guerrilla activity. It must always be kept in mind that there is a necessary minimum without which the establishment and consolidation of the first center is not practicable. People must see clearly the futility of maintaining the fight for social goals within the framework of civil debate. When the forces of oppression come to maintain themselves in power against established law, peace is considered already broken. In these conditions popular discontent expresses itself in more active forms. An attitude of resistance finally crystallizes in an outbreak of fighting, provoked initially by the conduct of the authorities. The third proposition is a fundamental of strategy. It ought to be noted by those who maintain dogmatically that the struggle of the masses is centered in city movements, entirely forgetting the immense participation of the country people in the life of all the underdeveloped parts of America. Of course, the struggles of the city masses of organized workers should not be underrated; but their real possibilities of engaging in armed struggle must be carefully analyzed where the guarantees which customarily adorn our constitutions are suspended or ignored. In these conditions the illegal workers’ movements face enormous dangers. They must function secretly without arms. The situation in the open country is not so difficult. There, in places beyond the reach of the repressive forces, the inhabitants can be supported by the armed guerrillas. We will later make a careful analysis of these three conclusions that stand out in the Cuban revolutionary experience. We emphasize them now at the beginning of this work as our fundamental contribution. Guerrilla warfare, the basis of the struggle of a people to redeem itself, has diverse characteristics, different facets, even though the essential will for liberation remains the same. It is obvious-and writers on the theme have said it many times-that war responds to a certain series of scientific laws; whoever ignores them will go down to defeat. Guerrilla warfare as a phase of war must be ruled by all of these; but besides, because of its special aspects, a series of corollary laws must also be recognized in order to carry it forward. Though geographical and social conditions in each country determine the mode and particular forms that guerrilla warfare will take, there are general laws that hold for all fighting of this type. Our task at the moment is to find the basic principles of this kind of fighting and the rules to be followed by peoples seeking liberation; to develop theory from facts; to generalize and give structure to our experience for the profit of others. Let us first consider the question: Who are the combatants in guerrilla warfare? On one side we have a group composed of the oppressor and his agents, the professional army, well armed and disciplined, in many cases receiving foreign help as well as the help of the bureaucracy in the employ of the oppressor. On the other side are the people of the nation or region involved. It is important to emphasize that guerrilla warfare is a war of the masses, a war of the people. The guerrilla band is an armed nucleus, the fighting vanguard of the people. It draws its great force from the mass of the people themselves. The guerrilla band is not to be considered inferior to the army against which it fights simply because it is inferior in firepower. Guerrilla warfare is used by the side which is supported by a majority but which possesses a much smaller number of arms for use in defense against oppression. The guerrilla fighter needs full help from the people of the area. This is an indispensable condition. This is clearly seen by considering the case of bandit gangs that operate in a region. They have all the characteristics of a guerrilla army: homogeneity, respect for the leader, valor, knowledge of the ground, and, often, even good understanding of the tactics to be employed. The only thing missing is support of the people; and, inevitably, these gangs are captured and exterminated by the public force. Analyzing the mode of operation of the guerrilla band, seeing its form of struggle, and understanding its base in the masses, we can answer the question: Why does the guerrilla fighter fight? We must come to the inevitable conclusion that the guerrilla fighter is a social reformer, that he takes up arms responding to the angry protest of the people against their oppressors, and that he fights in order to change the social system that keeps all his unarmed brothers in ignominy and misery. He launches himself against the conditions of the reigning institutions at a particular moment and dedicates himself with all the vigor that circumstances permit to breaking the mold of these institutions. When we analyze more fully the tactic of guerrilla warfare, we will see that the guerrilla fighter needs to have a good knowledge of the surrounding countryside, the paths of entry and escape, the possibilities of speedy maneuver, good hiding places; naturally, also, he must count on the support of the people. All this indicates that the guerrilla fighter will carry out his action in wild places of small population. Since in these places the struggle of the people for reforms is aimed primarily and almost exclusively at changing the social form of land ownership, the guerrilla fighter is above all an agrarian revolutionary. He interprets the desires of the great peasant mass to be owners of land, owners of their means of production, of their animals, of all that which they have long yearned to call their own, of that which constitutes their life and will also serve as their cemetery. It should be noted that in current interpretations there are two different types of guerrilla warfare, one of which-a struggle complementing great regular armies such as was the case of the Ukrainian fighters in the Soviet Union-does not enter into this analysis. We are interested in the other type, the case of an armed group engaged in struggle against the constituted power, whether colonial or not, which establishes itself as the only base and which builds itself up in rural areas. In all such cases, whatever the ideological aims that may inspire the fight, the economic aim is determined by the aspiration toward ownership of land. The China of Mao begins as an outbreak of worker groups in the South, which is defeated and almost annihilated. It succeeds in establishing itself and begins its advance only when, after the long march from Yenan, it takes up its base in rural territories and makes agrarian reform its fundamental goal. The struggle of Ho Chi Minh is based in the rice-growing peasants, who are oppressed by the French colonial yoke; with this force it is going forward to the defeat of the colonialists. In both cases there is a framework of patriotic war against the Japanese invader, but the economic basis of a fight for the land has not disappeared. In the case of Algeria, the grand idea of Arab nationalism has its economic counterpart in the fact that nearly all of the arable land of Algeria is utilized by a million French settlers. In some countries, such as Puerto Rico, where the special conditions of the island have not permitted a guerrilla outbreak, the nationalist spirit, deeply wounded by the discrimination that is daily practiced, has as its basis the aspiration of the peasants (even though many of them are already a proletariat) to recover the land that the Yankee invader seized from them. This same central idea, though in different forms, inspired the small farmers, peasants, and slaves of the eastern estates of Cuba to close ranks and defend together the right to possess land during the thirty-year war of liberation. Taking account of the possibilities of development of guerrilla warfare, which is transformed with the increase in the operating potential of the guerrilla band into a war of positions, this type of warfare, despite its special character, is to be considered as an embryo, a prelude, of the other. The possibilities of growth of the guerrilla band and of changes in the mode of fight, until conventional warfare is reached, are as great as the possibilities of defeating the enemy in each of the different battles, combats, or skirmishes that take place. Therefore, the fundamental principle is that no battle, combat, or skirmish is to be fought unless it will be won. There is a malevolent definition that says: «The guerrilla fighter is the Jesuit of warfare.» By this is indicated a quality of secretiveness, of treachery, of surprise that is obviously an essential element of guerrilla warfare. It is a special kind of Jesuitism, naturally prompted by circumstances, which necessitates acting at certain moments in ways different from the romantic and sporting conceptions with which we are taught to believe war is fought. War is always a struggle in which each contender tries to annihilate the other. Besides using force, they will have recourse to all possible tricks and stratagems in order to achieve the goal. Military strategy and tactics are a representation by analysis of the objectives of the groups and of the means of achieving these objectives. These means contemplate taking advantage of all the weak points of the enemy. The fighting action of each individual platoon in a large army in a war of positions will present the same characteristics as those of the guerrilla band. It uses secretiveness, treachery, and surprise; and when these are not present, it is because vigilance on the other side prevents surprise. But since the guerrilla band is a division unto itself, and since there are large zones of territory not controlled by the enemy, it is always possible to carry out guerrilla attacks in such a way as to assure surprise; and it is the duty of the guerrilla fighter to do so. «Hit and run,» some call this scornfully, and this is accurate. Hit and run, wait, lie in ambush, again hit and run, and thus repeatedly, without giving any rest to the enemy. There is in all this, it would appear, a negative quality, an attitude of retreat, of avoiding frontal fights. However, this is consequent upon the general strategy of guerrilla warfare, which is the same in its ultimate end as is any warfare: to win, to annihilate the enemy. Thus, it is clear that guerrilla warfare is a phase that does not afford in itself opportunities to arrive at complete victory. It is one of the initial phases of warfare and will develop continuously until the guerrilla army in its steady growth acquires the characteristics of a regular army. At that moment it will be ready to deal final blows to the enemy and to achieve victory. Triumph will always be the product of a regular army, even though its origins are in a guerrilla army. Just as the general of a division in a modern war does not have to die in front of his soldiers, the guerrilla fighter, who is general of himself, need not die in every battle. He is ready to give his life, but the positive quality of this guerrilla warfare is precisely that each one of the guerrilla fighters is ready to die, not to defend an ideal, but rather to convert it into reality. This is the basis, the essence of guerrilla fighting. Miraculously, a small band of men, the armed vanguard of the great popular force that supports them, goes beyond the immediate tactical objective, goes on decisively to achieve an ideal, to establish a new society, to break the old molds of the outdated, and to achieve, finally, the social justice for which they fight. Considered thus, all these disparaged qualities acquire a true nobility, the nobility of the end at which they aim; and it becomes clear that we are not speaking of distorted means of reaching an end. This fighting attitude, this attitude of not being dismayed at any time, this inflexibility when confronting the great problems in the final objective is also the nobility of the guerrilla fighter. In guerrilla terminology, strategy is understood as the analysis of the objectives to be achieved in light of the total military situation and the overall ways of reaching these objectives. To have a correct strategic appreciation from the point of view of the guerrilla band, it is necessary to analyze fundamentally what will be the enemy’s mode of action. If the final objective is always the complete destruction of the opposite force, the enemy is confronted in the case of a civil war of this kind with the standard task: he will have to achieve the total destruction of each one of the components of the guerrilla band. The guerrilla fighter, on the other hand, must analyze the resources which the enemy has for trying to achieve that outcome: the means in men, in mobility, in popular support, in armaments, in capacity of leadership on which he can count. We must make our own strategy adequate on the basis of these studies, keeping in mind always the final objective of defeating the enemy army. There are fundamental aspects to be studied: the armament, for example, and the manner of using this armament. The value of a tank, of an airplane, in a fight of this type must be weighed. The arms of the enemy, his ammunition, his habits must be considered; because the principal source of provision for the guerrilla force is precisely in enemy armaments. If there is a possibility of choice, we should prefer the same type as that used by the enemy, since the greatest problem of the guerrilla band is the lack of ammunition, which the opponent must provide. After the objectives have been fixed and analyzed, it is necessary to study the order of the steps leading to the achievement of the final objective. This should be planned in advance, even though it will be modified and adjusted as the fighting develops and unforeseen circumstances arise. At the outset, the essential task of the guerrilla fighter is to keep himself from being destroyed. Little by little it will be easier for the members of the guerrilla band or bands to adapt themselves to their form of life and to make flight and escape from the forces that are on the offensive an easy task, because it is performed daily. When this condition is reached, the guerrilla, having taken up inaccessible positions out of reach of the enemy, or having assembled forces that deter the enemy from attacking, ought to proceed to the gradual weakening of the enemy. This will be carried out at first at those points nearest to the points of active warfare against the guerrilla band and later will be taken deeper into enemy territory, attacking his communications, later attacking or harassing his bases of operations and his central bases, tormenting him on all sides to the full extent of the capabilities of the guerrilla forces. The blows should be continuous. The enemy soldier in a zone of operations ought not to be allowed to sleep; his outposts ought to be attacked and liquidated systematically. At every moment the impression ought to be created that he is surrounded by a complete circle. In wooded and broken areas this effort should be maintained both day and night; in open zones that are easily penetrated by enemy patrols, at night only. In order to do all this the absolute cooperation of the people and a perfect knowledge of the ground are necessary. These two necessities affect every minute of the life of the guerrilla fighter. Therefore, along with centers for study of present and future zones of operations, intensive popular work must be undertaken to explain the motives of the revolution, its ends, and to spread the incontrovertible truth that victory of the enemy against the people is finally impossible. Whoever does not feel this undoubted truth cannot be a guerrilla fighter. This popular work should at first be aimed at securing secrecy; that is, each peasant, each member of the society in which action is taking place, will be asked not to mention what he sees and hears; later, help will be sought from inhabitants whose loyalty to the revolution offers greater guarantees; still later, use will be made of these persons in missions of contact, for transporting goods or arms, as guides in the zones familiar to them; still later, it is possible to arrive at organized mass action in the centers of work, of which the final result will be the general strike. The strike is a most important factor in civil war, but in order to reach it a series of complementary conditions are necessary which do not always exist and which very rarely come to exist spontaneously. It is necessary to create these essential conditions, basically by explaining the purposes of the revolution and by demonstrating the forces of the people and their possibilities. It is also possible to have recourse to certain very homogeneous groups, which must have shown their efficacy previously in less dangerous tasks, in order to make use of another of the terrible arms of the guerrilla band, sabotage. It is possible to paralyze entire armies, to suspend the industrial life of a zone, leaving the inhabitants of a city without factories, without light, without water, without communications of any kind, without being able to risk travel by highway except at certain hours. If all this is achieved, the morale of the enemy falls, the morale of his combatant units weakens, and the fruit ripens for plucking at a precise moment. All this presupposes an increase in the territory included within the guerrilla action, but an excessive increase of this territory is to be avoided. It is essential always to preserve a strong base of operations and to continue strengthening it during the course of the war. Within this territory, measures of indoctrination of the inhabitants of the zone should be utilized; measures of quarantine should be taken against the irreconcilable enemies of the revolution; all the purely defensive measures, such as trenches, mines, and communications, should be perfected. When the guerrilla band has reached a respectable power in arms and in number of combatants, it ought to proceed to the formation of new columns. This is an act similar to that of the beehive when at a given moment it releases a new queen, who goes to another region with a part of the swarm. The mother hive with the most notable guerrilla chief will stay in the less dangerous places, while the new columns will penetrate other enemy territories following the cycle already described. A moment will arrive in which the territory occupied by the columns is too small for them; and in the advance toward regions solidly defended by the enemy, it will be necessary to confront powerful forces. At that instant the columns join, they offer a compact fighting front, and a war of positions is reached, a war carried on by regular armies. However, the former guerrilla army cannot cut itself off from its base, and it should create new guerrilla bands behind the enemy acting in the same way as the original bands operated earlier, proceeding thus to penetrate enemy territory until it is dominated. It is thus that guerrillas reach the stage of attack, of the encirclement of fortified bases, of the defeat of reinforcements, of mass action, ever more ardent, in the whole national territory, arriving finally at the objective of the war: victory. Δημοσιεύθηκε την Οκτώβριος 9, 1967 Μαρτίου 4, 2014 από GuevaristasPosted in Ernesto Che GuevaraΜε ετικέτα Ernesto Che Guevara,Guerilla Warfare,Ανταρτοπόλεμος.